Here are some interesting Wenger knives with icons on the scales. The Sportsman presentation line of knives that Wenger introduced from 1977 got many variations and Sportsmen knives were part of the history a long time before 1977 as well. On the picture are knives from 1980 until 2011. 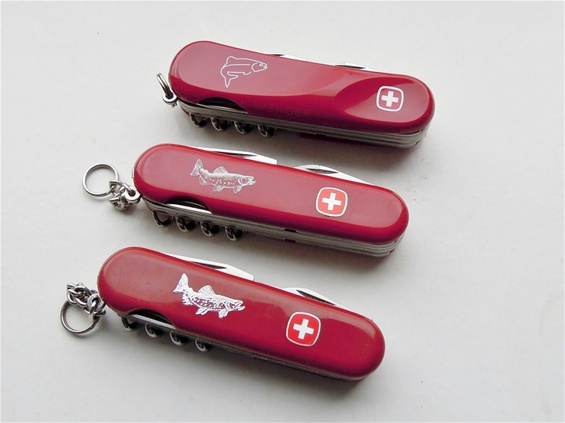 The number on the knives with the trout icon is referred to as the Fly Fisherman by collectors. The number is 1.19.25 usually. There are variations out there. The icon today is a bit changed and first time seen on the Classic line of Wenger knives after the mid 2005 history with the Classic 1.19.29 Fisherman 19. Let me know if before. The Evolution knife with the fish on the scale is named Evolution Fisherman 19 and sometimes Evolution Sport Fisherman 19. The number is 1 19 29 300. This knife got both tweezers and toothpick. The 1.19.25 usually only got tweezers. The tool configuration is the same and the functions fit well with a fish theme. The flat phillips is interesting and it does work well. It is very important to have in mind the knives with different symbols and icons. The use of evolution scales and the modern construction brought new life to this line of knives. The Evolution Fisherman 19 is a bit more universal in the design but no doubt that it is easy to identify it with a fish interest or hobby. 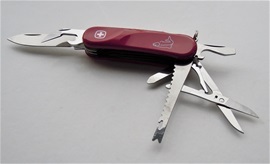 Symbols or advertisings on Swiss Army Knives got an incredible number of different aspects. The use of a fish symbol is much more firm because it enhances the sportsmen knives impression a great deal in a very positive way. SAKs are very much sportsmen knives. The outdoors image is a heavy aspect used by Wenger because it is the roots of a philosophy. I can only see positive factors in the Evolution Fisherman for a user or collector. Sadly Wenger knives are no longer made. The Evolution brought new life to this line of knives! 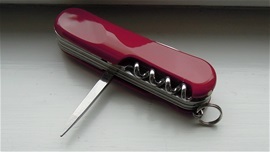 Wenger are made still but are called Victorinox delemont collection.